This chapter has so far considered only the industry’s ability to estimate long-term energy production for a wind farm. Usually, this is the most important task since, to date, most of the power purchase agreements are ‘take or pay,’ meaning that the utility or other customer is obliged to buy all the energy produced by the wind farm. As the penetration of wind power generation increases (in terms of the overall energy mix), fluctuations in energy output (caused by variations in wind speed) will be more visible on the electrical system. Transmission System Operators (TSOs) working to balance supply and demand on regional or national grid systems, will need to predict and manage this variability to avoid balancing problems. The point at which this is required changes from system to system, but it has been observed as becoming important when penetration of wind energy reaches about 5 per cent of installed capacity. As the level of penetration of wind energy into individual grids increases, it will become necessary to make wind farms appear much more like conventional plants and hence it will be necessary to forecast, at short to medium timescales (one hour to seven days), how much energy will be produced. In European countries where there is already a high level of penetration, such as Spain, Germany and Denmark, operators, managers and TSOs are routinely forecasting the output from their wind farms. These forecasts are used to schedule the operations of other plants, and are also used for trading purposes. Forecasting the wind energy production will grow in importance as the level of installed capacity grows. The wind industry must expect to do its very best to allow the TSOs to use wind energy to its best effect, which means aggregated output forecasts from wind farms must be accurate. In the UK, where the market is already deregulated, energy traders are using sophisticated forecasts to trade wind energy on the futures market. At the same time as improving the predictability of the output of wind energy plants through improvements in forecasting techniques, awareness of the true behaviour of conventional plants should be considered. In order to provide the best mix of plants and technologies, it will be important for all the different energy forms to be considered on an equitable basis. Therefore the proper, formal statistical analysis of both renewable and conventional plants is important. This task should be considered as an essential element of a wind energy development strategy and must be conducted on a total power system approach. As a result of its strategic importance as described above, forecasting has been the focus of considerable technical attention in recent years. A good source of general review materials, as well as detailed papers, can be found in Landberg et al (2003). Although there are a variety of different techniques being used, they all share similar characteristics. 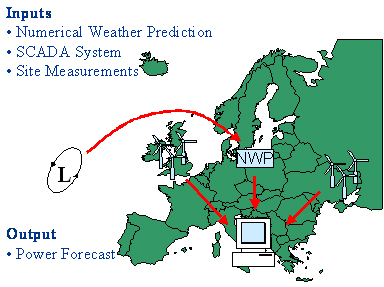 It is therefore possible to provide a generic description of the techniques presently being used, whereby data is provided by a weather forecast, and production data is provided by the wind farms. The two sets of data are combined to provide a forecast for future energy production. Figure I.2.12 provides a schematic picture of typical forecasting approach. To integrate wind energy successfully into an electricity system at large penetration levels of more than 10 per cent, accurate wind energy predictions are needed. The Numerical Weather Prediction (NWP) models run by national institutes are typically of continental, if not global, scale. Consequently, their resolutions tend to be too coarse for wind energy needs. The model run by the Danish Meteorological Institute for north-west Europe, for example, has a minimum horizontal resolution of approximately 5 km. High-resolution NWP models: these are essentially local (nested) meso-scale versions of the original NWP model, and are often termed ‘storm-scale’ or ‘convective-scale.’ They aim to model local thermal and terrain effects that are not apparent at the coarse scale. Computational requirements – the formulation and execution of the models are computationally expensive.